The Connect Fund – What Has it Achieved? The Connect Fund was created to build a better social investment market in England. A partnership between the Barrow Cadbury Trust and the Access Foundation, the £3 million grant and investment fund supports social investment intermediaries and voluntary sector organisations to advance infrastructure initiatives. Reflecting the values of the social sector, the Connect Fund strives to promote collaboration, champion an impact first approach to investment, and convene new voices to help shape the future of social investment. Two years on, what has the Connect Fund achieved? Since its launch in June 2017, £2.2 million has been disbursed to 51 projects across 9 regions in England. A further £500,000 was committed alongside the Connect Fund by external funders to match or part fund these projects. The Connect Fund has built online and face-to-face learning communities which have highly encouraging buy-in and participation. While only 20% of these projects have finished, some initial outputs and interim findings can be shared. The Connect Fund uses both quantitative and qualitative evaluation methods, independently supported by NPC, to gather critical feedback on its effectiveness. 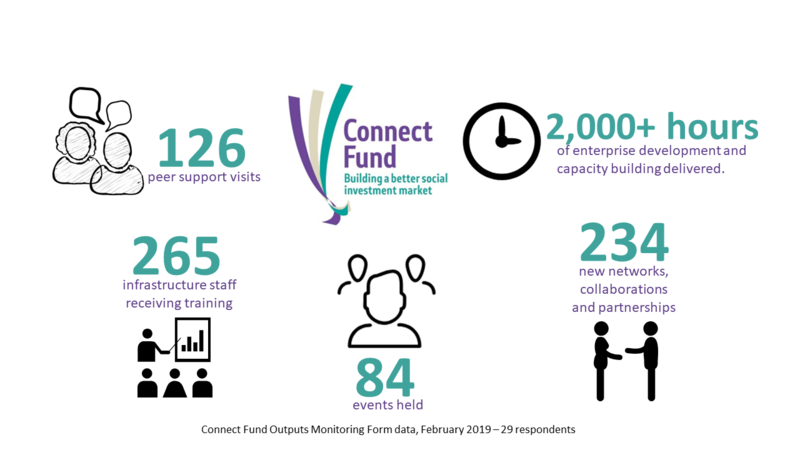 An external survey has found that 59% agree there are better connections between social investment intermediaries and VCSE infrastructure organisations, and 91% strongly agreed or agreed with the statement that the Connect Fund supports collaborative working. Over 1/3 of respondents specifically mentioned increasing connections, networks or partnerships as a result of Connect Fund projects. Voluntary sector infrastructure organisations are building the knowledge and skills to support enterprise development and social investment. These initiatives have created an ecosystem of social sector support organisations that champion social investment and develop pathways to enterprise. Infrastructure organisations have created clusters of activity for skill development, awareness-raising, communities of practice and peer learning to advance knowledge of and engagement with social investment. The focus has been to avoid duplication by strengthening anchor institutions and linking voluntary sector infrastructure to existing resources such as Good Finance. The early foundations are being laid for a voluntary sector that is informed and engaged with social investment with the potential to underpin place-based initiatives across the regions. The Connect Fund has bridged gaps in the market by funding joint initiatives. The social investment sector is increasingly evolving to focus on blended, flexible or patient finance. In a fragmented market, the need for innovative, more inclusive and collaborative problem-solving is evident. The Connect Fund has supported projects to improve market information, open data sharing, and strengthen sector networks. As our funding evolves, we will move from a general approach, to more strategic alignment to ensure effectiveness, drive further collaboration and ensure the legacy of interventions. As a result of Connect Fund projects, Social Enterprise UK, Women in Social Finance, UK Community Foundations, Responsible Finance, VONNE and many other regional networks like Social Enterprise East of England have been more engaged with social investment. Across multiple issues, the Connect Fund has provided the first risk finance to intermediaries and infrastructure organisations working jointly to solve challenges. A priority for the Connect Fund is to increase the diversity of voices in social investment. This means regional diversity to broaden a London-centric market, and diversity in terms of the protected characteristics of race, gender, sexual orientation, and disability, among others. In addition to funding across the 9 regions, the Connect Fund actively supported 9 diversity projects. The Connect Fund was the sole funder of the Diversity Forum, a much-needed, timely and insightful coalition of social investment intermediaries committed to expand the diversity of investment decision-makers. In addition to its learning community events, the Connect Fund helped to convene The Gathering for 150+ social investors in Leicester. This was a co-created event for the sector, by the sector that took over one year for the Steering Group to organise, as a key means of sharing learning and driving collaboration. The work of the Connect Fund is not done. Local infrastructure is vitally important to place-based initiatives and social investment at a time when the market is highly fragmented. We will continue to advocate for the value of supporting social investment infrastructure. Resource to drive forward collaboration to fill gaps in the market remains essential. Challenges remain to be solved. In partnership with Access, the Connect Fund has a role to champion infrastructure, to promote collaboration, to convene new voices and to catalyse enterprising initiatives. Let us know if you would like to be part of building these solutions.